Rudolph takes a funny approach to a serious topic, with a recent report showing each American uses an average 3 rolls of toilet paper a week. Those two things can, and should, go together, Rudolph says, even though the 100 percent recycled product has kind of a bad rap. “Yeah, maybe it’s a little scratchy—so what, don’t be a baby,” she says from her perch behind a drum kit. 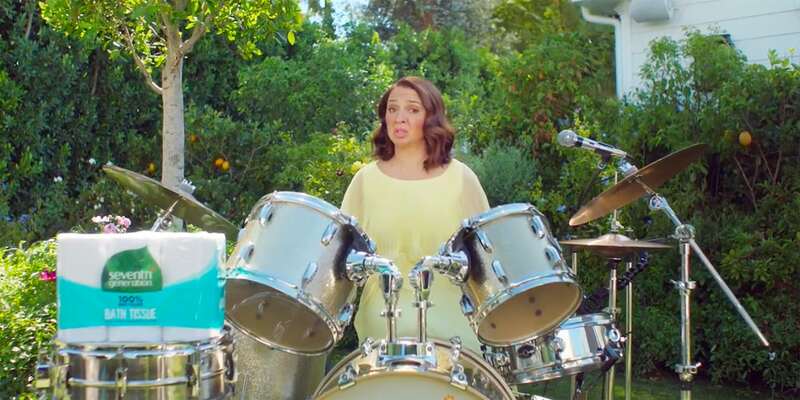 Seventh Generation and agency 72andSunny obviously know what an asset they have in Rudolph, giving her plenty of room to do her biting, soulful, over-the-top musical thing in “Trees and Bees,” a 60-second spot that features some improv flourishes from the SNL alum. The script is the result of the three-partner collaboration, the agency says, as Rudolph hits her third year as spokescomedian for the brand’s household cleaning supplies, laundry detergents and personal care products. The veteran actress, who drummed her way through a Seventh Generation tampon ad in December, introduces a friend to help get her message across this time around. She has two buddies, actually. One speaks only to her (that would be Mike the Tree) and the other dude (name unknown) communicates through sweet, lounge-lite keyboard chords. They’re both delightful, though Rudolph is clearly the star here, highlighting a serious eco-challenge (albeit in a silly way) and offering a solution. According to a report from the Natural Resources Defense Council and Stand.earth, the average American uses three rolls of toilet paper a week, accounting for 20 percent of the global tissue consumption while making up only about 4 percent of the world’s population. TP is a $31 billion annual business in the U.S.
“Major brands’ refusal to create more sustainable products makes consumers unwittingly complicit in flushing forests down the toilet,” the study says, noting that the “tree-to-toilet pipeline does massive harm” to North American forests and worsens the world’s climate crisis. To drive the point home further, Seventh Generation will hold an event dubbed a “Root-In” on Wednesday at Grand Central Terminal in New York. Mike the Tree will be one of nearly 500 trees on site, representing fauna lost for the sake of ultra-soft TP. (Most best-selling brands earn “F” grades on sustainability scorecards, the NRDC says). The saplings will be donated to NYC parks after the stunt. The latest Rudolph spot debuts during Tuesday late-night programming on NBC and will also air across digital and social channels.